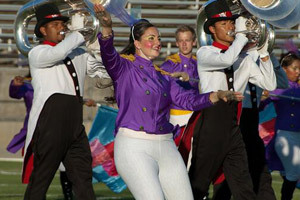 The 2009 Drum Corps International Tour event in Stockton, Calif. brought loads of excitement for fans on the West Coast. Eleven corps representing DCI's World, Open and All-age classes performed at the June 28 event. Competitively, the Blue Devils came out on top with Santa Clara stealing a few captions away, making it a tight race for the number one spot. Trekking all the way from Ohio to go head-to-head with their western rivals, the Bluecoats have been part of the lineup for many of the most recent Pacific Coast events. As competition continues to heat up, East, West and Midwest corps will start to make their way to the center of the country for the DCI Southwestern Series, July 16-18 in Texas, while ultimately setting their sights on the 2009 World Championships, August 4-8 in Indiana. View photos from this event Find an upcoming DCI Tour event near you! Photos courtesy of Chris Maher, corpsreps.com.